I recently accepted the task of producing an image per month with which to demonstrate the hidden wonders of Seaton Marshes in order to promote the area and encourage people to look more closely at the site. I immediately set about attempting to take numerous shots of the visiting waders to the estuary, I previously had not spent much time at the hides and so was able to make the excuse to do so. I found that getting the image I wanted was going to be quite a task and so following another disappointing session I wandered dejectedly back along the path to see if I might find the elusive Otters at Borrow pit, that all and sundry seemed to have observed other than me! Staring at the ground to ensure my footing, my eye was caught by a flash of dark black against the somewhat bland light green bank - a Beetle. This would need my Macro lens, so kit dumped to the ground, lens changed, I was now in my element. I set about taking a series of shots of this fantastic beetle. Now happier I moved on only to find more examples of this beetle, many of them in a mating frenzy. A full head count revealed 41 specimens, I later ratified this with another 2 counts with my children on visits over the next 2 days - see previous blog. What I did not know at the time was that I had stumbled across an Oil Beetle which due to severe decline in numbers are fairly rare. 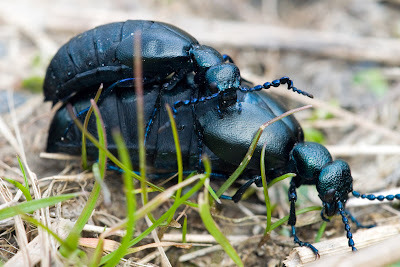 Oil beetles are from family of beetles that share a fascinating life-cycle in which the larvae are nest parasites of certain bees . 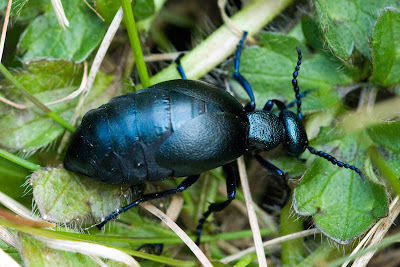 This species, Meloe proscarabeus is bluish black in colour with a long swollen abdomen, which is particularly pronounced in females when they are producing eggs. Females are usually much bigger than males as can be seen above. 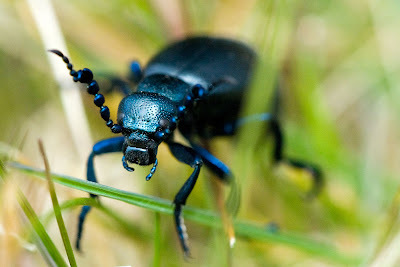 Buglife, the Invertebrate Conservation Trust, is currently running the Oil Beetle Conservation Project, which aims to establish the current range of Britain’s remaining oil beetles and to carry out research into their life-cycles and ecology in order to guide conservation actions targeted at these beetles. 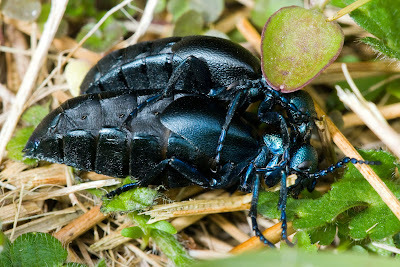 I went to Seaton Marshes on Friday and saw loads of these amazing oil beetles, too. It is a fantastic spot for wildlife!